Tokyo, September 25, 2017 - NEC Corporation (NEC; TSE: 6701) today announced the development of acoustic augmented reality (AR) technology that gives a "voice" to objects that can only be heard by users of specialized wireless earphones (hearable devices). These advanced devices also enable users to easily identify the direction and location that the voices originate from, making this technology ideal for marketing purposes and guide services. The technology wirelessly provides "stereophonic sound," a realistic sound field that virtually produces a three dimensional sense of direction and distance for a sound. 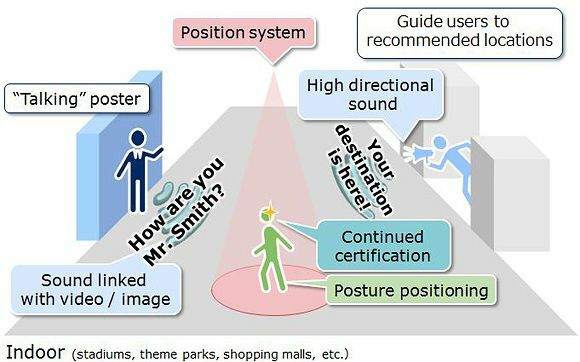 Moreover, "sound localization" fixes the position of a sound, regardless of the facial orientation or direction a user is moving. This is accomplished by using nine axis motion sensors mounted on a hearable device. Possible applications for this technology include the creation of promotions, as well as navigation and guidance services that are customized for individual needs, such as posters in a facility that "talk" to users directly. "NEC is aiming to commercialize this technology as a hearable platform service that combines ear acoustic authentication with indoor positioning, vital sensing and other technologies by the end of FY2018," said Tomonori Kumagai, General Manager, Business Development Division, NEC Corporation. "Going forward, NEC aims to continue proposing new approaches to computing that utilize hearable devices without the need for screens."